Burgers are a delicious indulgence with endless possibilities. The two provided below are gourmet twists on the classic hangover cure from opposite sides of the spectrum. I used organic, grass-fed beef from Whole Foods, but bison is an even leaner choice if you can get your hands on it. The name of this burger doesn’t lie; it really needs two hands with all the great toppings involved. Provolone cheese, caramelized onions, grilled ham, and barbecue sauce is a winning combination alongside fresh lettuce, tomato slices, and pickles. I used a grill pan instead of the grill since going outside has become unenjoyable, and the directed cooking time worked just fine. A grill pan is also handy since it’s big enough to throw a ton of stuff on it. In this case, I was able to grill the ham slices and toast the buns at the same time. The barbecue sauce is what ings everything in this burger together. My favorite kind is Toigo Farms bourbon peach barbecue sauce. 1. Melt the butter in a large skillet and add the onions. Turn the heat to medium low and cook the onions, stirring occasionally, until caramelized, about 20 minutes. Remove from the heat and keep warm. Refrigerate if making ahead (they’ll keep for 1 day), but warm the onions before serving. 2. In a large bowl, gently blend the meats, garlic, salt, and pepper using your hands. Gently form the meat into six patties large enough to cover the size of your bun. Put a thumbprint in the middle of each patty. (This is especially important with this burger because of all the stuff you’re going to put on top.) Refrigerate until ready to cook, up to 4 hours. 3. Oil the grill racks (or grill pan). Heat your grill using all burners set on high and with the lid closed for 10-12 minutes. 4. Arrange the patties on the grill (or grill pan) and cook for 4 to 5 minutes, then turn and cook for an additional 5 to 6 minutes, or until they give slightly to the touch. When you turn the burgers, place the ham on the grill (or grill pan). About 2 minutes before the burgers are done, turn the slices of ham over, slide the rolls on the grill to toast, and place a slice of cheese on each burger. 5. When the burgers are done, remove them, the buns, and ham for the grill. To build the burgers, place them on the bottom half of each roll. Top with a couple slices of grilled ham, a tablespoon of the barbecue sauce, and caramelized onions. Add tomato, lettuce, and any other condiments you prefer. Adapted from: “The Two-Handed Burger.” The Best of Fine Cooking: Grilling; 101 Best Barbeque Recipes. The Taunton Press, Inc. 2014. Print. This recipe had me at Roquefort butter. I’m always a sucker for cheese, especially the gourmet kind. It pairs perfectly with the red onion and watercress, both of which contribute a nice touch of texture and subtle flavor. Best of all, this hamburger couldn’t be more straightforward. Once the burger patties are taken care of, the toppings are a cinch. The Roquefort butter is just that; Roquefort cheese and softened butter, and it is a sinful as it sounds. 1. Heat the oven to 400 degrees Fahrenheit. Season the beef with salt and pepper and shape it into four patties about 1 inch thick. Season both sides of each patty with salt and pepper. 2. In a small bowl, mix the Roquefort and butter with a rubber spatula. 3. Heat a large, heavy sauté pan over medium-high heat for 1 minute. Set the hamburgers in the pan, reduce the heat to medium, and cook until well owned on the first side, 4 to 5 minutes. Flip the burgers and cook to your liking: another 4 minutes for medium rare, or another 6 minutes for medium. 4. Meanwhile, toast the buns or rolls, split sides up, on a baking sheet in the oven until crusty and very light gold, 6 to 8 minutes. Spread both sides of each bun with about 1 tbsp. of the Roquefort butter. 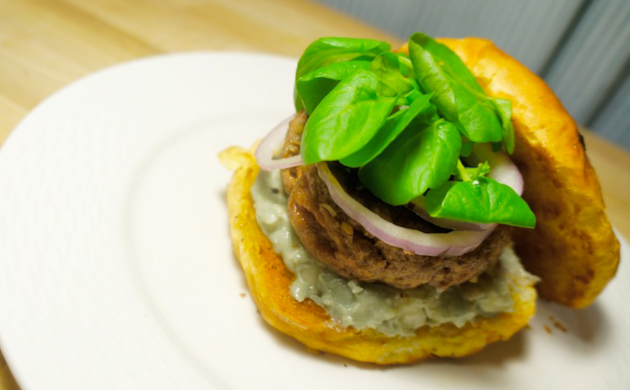 Serve the hamburgers on the toasted buns, topped with the onion and watercress. Adapted from: “Hamburgers with Watercress and Roquefort Butter.” The Best of Fine Cooking: Grilling; 101 Best Barbeque Recipes. The Taunton Press, Inc. 2014. Print.